The first, double-disc, multi-label anthology of the sometimes overlooked singer/songwriter Eric Andersen tells a compelling tale. 'The Essential' is an alternative and increasingly popular title among artists for whom 'Greatest Hits' would be vulgar, cheapening or simply inaccurate. For Eric Andersen, it's ideal - he's been a prolific maker of albums for a variety of majors and independents for 50 years, and a definitive pan-label compilation of his work is long overdue. Despite having dipped into his catalogue on and off since the 1990s, until I was confronted by the track-list of this formidable collection and began to look into the provenance of each song, I hadn't appreciated just how much music he has committed to record. Sure, sometimes his discs have been uneven, but all of them, without exception, have had something to recommend them. This two-disc set is the first seriously weighty Andersen anthology – a more slimline collection on Australia's Raven Records, issued over ten years ago, was decent enough, but this surpasses it in every respect. Andersen sang like a more rakish, earthier Nick Drake, and continues to do so to this day. He's far less adventurous with chords though, and musically more in keeping with Dylan. His frail, fatigued vocal style can deter some, but those who persist will find moments of beauty and shimmering elegance in his work (just close your eyes and let 1970's "Secrets" or "I Will Wait", which proved he was keeping up with Leonard Cohen and Judy Collins, wash over you). And because he always sounded a little older than his years, it means that decades on, his voice hasn't undergone any shocking deterioration. By all accounts, at first, he wanted little to do with this release, claiming an aversion to nostalgia. But all art involves nostalgia. Once something's completed and ready for release, it's in the past. Every time we listen to a song or look at a painting, we're engaging with what has gone. Fortunately, he had a change of heart, so these are artist-approved selections, compiled by Andersen to provide snapshots of every stage of his career. Not only that, he got sufficiently behind this release that an Indiegogo campaign was launched to help give it some fanfare and fund an accompanying tour. Fairly short shrift is given to the Vanguard years, even though Andersen made five albums for that most fabled home of the 1960s' biggest folk stars. It's obvious that, quite understandably, he wants to disabuse listeners of the idea that he was just one more Greenwich Village folky. Instead, some light is shed on his unsung Warner Bros phase – two transitional albums that are among the hardest of his to find in physical form. In particular, Eric Andersen (Warner Bros, 1970) was a notably vigorous and vibrant set and it challenges the truism that Blue River (Columbia, 1972) is the classic. It's good to see it represented here. Then we're on to the Columbia period, with, of course, the yearning "Blue River" itself and its prominent Joni Mitchell response-vocal. Fans will know, but newcomers might not, that this was when the momentum of Andersen's career was dealt a near-lethal blow. 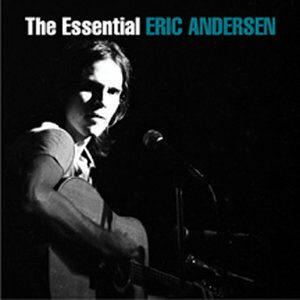 The Blue River album had done brisker business on the charts than any of its predecessors and Andersen was perfectly placed to catch the singer/songwriter wave of the early 1970s. His much toiled-over followup, Stages (Columbia, 1973, released: 1991), with cameos from Joan Baez, Leon Russell, and Dan Fogelberg, should have consolidated this success. Then the tapes were mislaid (and not retrieved for two decades) and Andersen was left to pick up the pieces and move to Arista, where, on Be True to You (1975) he re-cut several of the Stages songs (this complication favours the Stages versions). His albums for Clive Davis's label are, bar one track, barely acknowledged (they've had long periods of unavailability, although you can now get them on a twofer from BGO Records, issued last year). The rather wan Sweet Surrender (Arista, 1976) isn't represented at all; no huge loss. There is, however, a fleeting chance to enjoy a cut from Midnight Son, a 1979 outing that came about from a deal with CBS Holland. The bulk of disc two brings us up to speed on Andersen's '80s, '90s, and '00s. The first of those decades was notoriously unkind to singer/songwriters, especially the ones regarded as folk stars. Even Joan Baez struggled to find a supportive home for her recording work. Andersen made just a couple of albums but, on the upside, managed to escape the ravages of the synth revolution that afflicted Joni Mitchell's output. Things picked up again in the following decades, particularly on the bracing title track of You Can't Relive the Past (Appleseed, 2000), featuring some acerbic vocal assistance from Lou Reed. Selections from Andersen's plentiful '90s and post-millennial solo work, as well as some of the albums he made as part of the trio Danko/Fjeld/Andersen, bring the collection to an impressive close. This is a highly recommended roundup of an artist who's sometimes relegated to the second division of singer/songwriters, fairly or unfairly depending on your tastes. Not only is it a fantastic primer for Andersen newcomers, but it'll also have the rest of us hurtling back in time to sample the individual albums with renewed appreciation. A fitting way to mark the year of this talented man's 75th birthday.